Anyone for tea? Jorg Muller’s tea is now sold in Harrods. Barry’s tea still has that kick-awake taste in the morning when you take the first gulp; but tea in general has changed, and changed dramatically. Just look at the choice of teas next time you reach for a packet. Where once there was only Lyons, Barry’s and PG Tips, now there has to be a choice of at least 50 different blends including herbal, organic, loose or bagged, or the plain ordinary black. And I was surprised to learn that there are at lest two tea blenders in Galway; including Solaris Botanicals, which not only won last month’s Junior Chamber of Ireland Entrepreneur of the Year, but in the same week clinched a deal to supply Harrods of London. 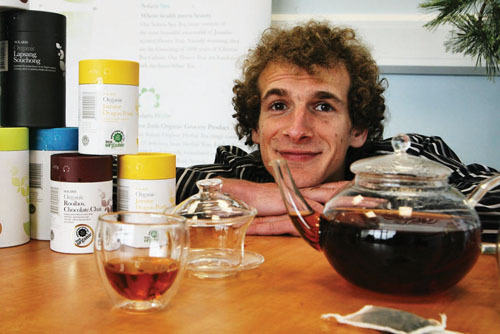 It is all the idea of Jorg Muller, surely the Monty Don of the tea blending business. He grew up near Stuttgart with a mother who believed in the benefit of herbal remedies rather than medicine from the pharmacy. Instead of serving his military service in the army, Jorg opted for social work, and came to Gorey, Co Wexford. He worked with handicapped children, and was asked to create a herb garden. He became hooked on herbs and on Ireland. He studied herbal medicine and tea blending for four years at Preston University, where he also met his wife Karen. Jorg and Karen opened their business at the Ballybane Enterprise Centre in 2003. They sourced hand-picked ‘Spring Flush’ whole leaf teas, to ensure optimum freshness and high anti-oxidant content. Herbs and spices are imported from India, China and Europe. More than 200 fresh ingredients are used in their products. As well as the table teas we are all familiar with, Solaris Botanicals has a tea for every conceivable condition from Aphrodite for nerves, and Hercules for energy, to Dionysus for digestion and Homer for heart and circulation. Clearly new teas are part of our new age. Jorg and Karen’s company has gone from strength to strength. Last year it won the ‘Best Irish Organic Grocery Product’ from Bord Bia, and three Gold Medals in Europe’s Great Taste Awards (considered the Oscars of the food business ), including special awards for its organic Green tea Chai and Earl Grey. It’s an impressive success story at a time when business is changing. All Solaris Botanicals’ products are distinctively packaged and are available in Galway from Healthwise, Evergreen, McCambridge’s, Joyces, Mortons, and Ard Bia, which are now selling a selected range of quality foods. They also offer a range of gift ideas which you may want to check out (Tel: 091-442450/ 750020, or www.solarisbotanicals.com ), and see their attractive glass teapots and containers. But what caught my eye was the offer of personalised blends which would make a unique gift for a wedding, birthday, or a special ‘Thank you’. Each new blend costs €50, and can be sent world-wide. This is a good time for us all to get our Christmas dinner sorted. Readers might know from the past that I believe Galway is blessed with outstanding butchers, not only in the city but in the towns around. For a time it seemed that butchers were a dying breed. Most of their customers lead busy lives. They do their shopping in the supermarket, and buy their meat there also. In recent years the HSE had asked butchers, and all food purveyors, to invest in all kinds of expensive equipment, and retraining staff. It all seemed invasive and a bit of bother, and if the business was falling away many family butchers thought the change a step too far, and closed shop. Finnerty’s offer the full range of fresh organic geese, turkeys, ducks and game. For the last two years Finnerty’s are national champions for their pork sausages, made from a secret recipe that has been handed down through the Finnerty generations. CR Tormey’s, Headford Road Shopping Centre ( 091 564067 ) also offer the full range of Christmas birds (as do all the butchers mentioned in the Diary ), and are the only suppliers in the South of the renowned traditionally cured Fermanagh ‘Black Bacon’. They also prepare their famous 4 Bird Roast: a full goose, with (in order ) pheasant, duck and a chicken sewn inside. It needs to be carried to the table over the heads of the guests, in Medieval style. Eamon Mc Geough’s (Barrack St., Oughterard, 091 552351 ) has been pushing out the boundaries of the family butcher for years with their imaginative dried Connemara beef and lamb, their spiced beef (turned every day for eight weeks in a vat of cloves, celery, treacle, honey and a little salt ), and their German Kassler, which is a cured loin of pork. Try McGeough’s simple but delicious stuffing: bread crumbs, butter, smokey bacon, fresh parsley and spices. Martin Divilly’s at Westside (091 523947 ) is again a wonderland of choice and quality. Martin offers a plump goose from Tony Reagan’s of Cork in an attractive presentation box, and his turkeys come from Ballyfax farm at the Curragh, and from Limerick. There is a great take up on his trays of freshly prepared dishes. ‘People are not eating out in restaurants as much as before,” he told me, “ but they want something special for home on Saturday night.” And in the spirit of good cheer, Divilly’s have reduced their prices by an average of 12per cent on all products. Next week: When it comes to Christmas gifts in Galway, it’s a buyers market.